After the success of 1978’s Superman, the eventual appearance of a sequel was more than probable - it was nearly inevitable. 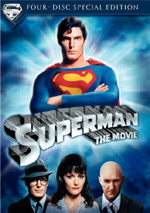 The film’s producers were so certain that the first movie would do well that they tried to make the sequel simultaneously, and the original flick includes a title notation that proclaims the upcoming release of Superman II. The production team nearly paid for that chutzpah as the road to 1981’s SII was much rockier than originally anticipated. The simultaneous shooting schedule was shelved midway through the event to make sure that the first movie would be ready for a Christmas 1978 release; much of SII had been filmed but that project went on the back-burner. However, when the shoot for the second flick was ready to resume, director Richard Donner was summarily canned from the sequel and replaced with Richard Lester, best known for the Beatles’ movies A Hard Day’s Night and Help!. Superman II appears in an aspect ratio of approximately 2.35:1 on this Blu-ray Disc. While not a gorgeous presentation, the movie usually looked good. When I reviewed Superman, I mentioned that it included softness caused by three issues: cinematographic choices, visual effects, and “I have no idea”. The first two continued to affect the definition of Superman II, but happily, the third went missing; no longer did I see shots that were soft for no logical reason. This meant that softness still occurred at times, but those instances were less frequent and less intrusive since they made sense. Overall clarity was quite positive, as most of the movie offered nice delineation. No issues with jagged edges or moiré effects occurred, and I noticed only a little edge enhancement. Print flaws seemed absent. No distractions from specks, marks or other debris marred the presentation. Colors appeared good. They came across as reasonably lively and vivid, as I noticed no issues connected to the hues. Black levels were acceptably deep and firm, while shadows appeared clear and smooth. Overall, I found a lot to like about the image. Only the instances of softness made this a “B” picture, and it was a high “B” that bordered on a “B+”, while Superman was a low “B-“ that almost became a “C+”. I also felt pleased with the DTS-HD MA 5.1 soundtrack of Superman II. The soundfield was largely oriented toward the front spectrum, where I heard fairly good atmospheric delineation. The forward area provided a nice range of effects that broadened the action well, and music seemed to show good stereo separation as well. Surround usage seemed good but not tremendously involving; the rears offered general reinforcement of the forward spectrum but didn’t provide a whole lot of unique activity. Nonetheless, they made the entire package appear acceptably broad and contributed nice usage when appropriate. How did the picture and audio of this Blu-ray compare to those from the original 2001 release? The sound remained similar, though I thought the Blu-ray’s lossless track offered a little more kick. Visuals were better, even though the Blu-ray’s higher resolution exposed the soft shots more clearly. Nonetheless, the Blu-ray tended to be tighter and more vivid, so it offered a definite upgrade. Expect mostly the same extras from the 2006 DVD, though some changes occur. First comes an audio commentary with executive producer Ilya Salkind and producer Pierre Spengler. Both sit separately for this edited track. The piece looks at controversies related to the change in director from Richard Donner to Richard Lester, and it gets into connected issues. We also learn about music, effects, and other technical elements related to the movie. The disc also includes both the film’s trailer and a Deleted Scene. Called “Superman’s Soufflé”, this 40-second clip offers Superman’s first attempt at cooking. It goes for a comedic bent and isn’t anything special. Next we go to a “vintage special”. 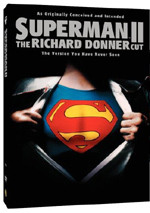 The Making of Superman II runs 52 minutes, 15 seconds as it presents movie clips, shots from the set, and interviews. We hear from Salkind, Spengler, producer Alexander Salkind, director Richard Lester, matte artist Ivor Beddoes, special effects supervisor Colin Chilvers, and actors Christopher Reeve, Terence Stamp, Sarah Douglas, and Gene Hackman. The show looks at the movie’s story and characters, stunts and fight choreography, performances, the work of the art department and costumes, locations, sets and matte paintings, various visual effects, editing, and other technical topics. A modern featurette shows up via First Flight: The Fleischer Superman Series. The 12-minute, 55-second piece features notes from filmmaker’s son Richard Fleischer, author Leslie Cabarga, cartoon historian Jerry Beck, animator/director Myron Waldman, Superman: The Animated Series director Dan Riba, animator’s son Leonard Grossman, S:TAS writers/producers Paul Dini and Bruce Timm, DC Comics librarian Allen Asherman, and writer Roger Stern. The piece looks at the history of the Fleischer Studios, their various innovations and the tone of their work, their involvement with the Superman series, cast and audio, and reflections on Fleischer’s nine Superman shorts. Finally, we get nine 1940s Fleischer Studios Superman Cartoons that fill a total of 79 minutes, 29 seconds. The following shorts appear: “Superman” (10:28), “The Mechanical Monsters” (11:03), “Billion Dollar Limited” (8:36), “The Arctic Giant” (8:35), “The Bulleteers” (8:02), “The Magnetic Telescope” (7:38), “Electric Earthquake” (8:43), “Volcano” (7:58), and “Terror on the Midway” (8:21). I worried that these shorts would be relentlessly corny and cheesy. Happily, they actually were pretty entertaining. Yeah, they show their age, and they can seem a bit formulaic, but they offer some good action and thrills. The animation is better than expected, and the stories use Supes well; this isn’t the dull slug of “Mole-Men”. Indeed, these cartoons are practically all action; they don’t spend much time with characters or exposition. That’s fine given their brevity, as I wouldn’t expect much more from them. Animation is a great format for a character like this, as it allows him into many dramatic situations that would’ve been exceedingly impractical to film in a live-action format. My only real complaint is that none of them feature any of Superman’s notable villains. We get anonymous baddies and monsters instead of folks like Lex Luthor. Nonetheless, the shorts are a lot of fun and worth a look. Note that the Fleischer shorts are new to Superman II; they originally appeared alongside Superman on the four-DVD 2006 release. 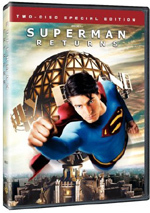 The 2006 Superman II DVD included a 1988 TV special that goes missing here, but it’ll turn up elsewhere in the “Superman Motion Picture Anthology” set alongside Superman IV, which is a more logical location chronologically. Superman II remains a flawed but fun film, one that often balances comedy and action with romance and drama. It can be a tentative mix, but for the most part, it worked well and created an interesting program. The Blu-ray provides generally strong picture along with very nice audio and a good set of supplements. This becomes the best way to see this inconsistent but enjoyable movie. 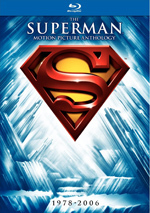 Note that as of June 2011, you can only purchase this Blu-ray edition of Superman II as part of an eight-disc “The Superman Motion Picture Anthology”. 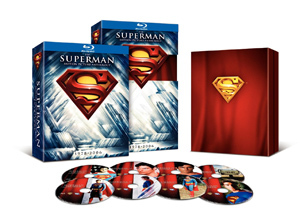 This includes Superman, its three 1980s sequels, 2006’s Superman Returns and Superman II: The Richard Donner Cut, and a disc of bonus materials. I’m sure the films will be available individually at some point, but that date is currently unknown.